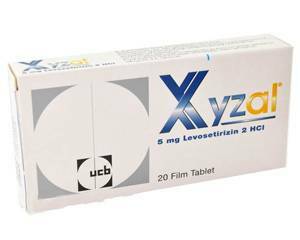 Xyzal tablets contain the active ingredient levocetirizine dihydrochloride, which is a type of medicine called a non-sedating antihistamine. It works by preventing the actions of histamine. Histamine is a substance produced by the body as part of its defence mechanisms. It is stored in cells called mast cells, in almost all tissues of the body. When the body reacts to a foreign substance (known as an allergen, eg flower pollen), the mast cells stimulated by the allergen release their stores of histamine. The released histamine then binds to its receptors (H-1 receptors), causing a chain reaction that results in allergic symptoms. It causes an increase in blood flow to the area of the allergy, and the release of other chemicals that add to the allergic response. All this results in the symptoms of an allergic reaction. In hayfever, histamine causes inflammation of the nose, eyes, skin or airways and results in itchy watery eyes, a runny nose, sneezing and nasal congestion. Levocetirizine works by blocking histamine receptors. It does not prevent the actual release of histamine from mast cells, but prevents it binding to its receptors. This in turn prevents the release of other allergy chemicals and increased blood supply to the area, and provides relief from the typical symptoms of hayfever. Levocetirizine can also be used to relieve the symptoms of a condition called chronic idiopathic urticaria. This is a chronic itchy rash, similar to nettle rash, but with no apparant cause. Blocking the actions of histamine relieves the itching and reduces the rash associated with this condition. Levocetirizine is called a non-sedating antihistamine as it does not enter the brain in significant amounts, and is therefore unlikely to cause drowsiness. However, some people may experience some slight sleepiness or fatigue.